, a voluminous French writer, who was burnt for his religious opinions at Paris, was born at Orleans about 1509, of a good family. Some have reported that he was the natural son of Francis L but this does not agree with the age of that monarch, who was born in 1494. 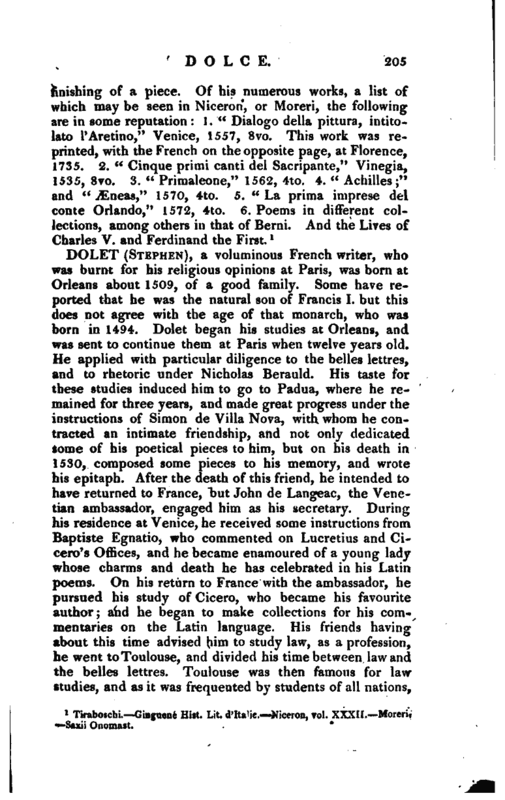 Dolet began his studies at Orleans, and was sent to continue them at Paris when twelve years old. He applied with particular diligence to the belles lettres, and to rhetoric under Nicholas Berauld. His taste for these studies induced him to go to Padua, where he remained for three years, and made great progress under the instructions of Simon de Villa Nova, with whom he contracted an intimate friendship, and not only dedicated some of his poetical pieces to him, but on his death in 1530, composed some pieces to his memory, and wrote his epitaph. After the death of this friend, he intended to have returned to France, but John de Langeac, the Venetian ambassador, engaged him as his secretary. During his residence at Venice, he received some instructions from Baptiste F,griatio, who commented on Lucretius and Cicero’s Offices, and he became enamoured of a young lady whose charms and death he has celebrated in his Latin poems. 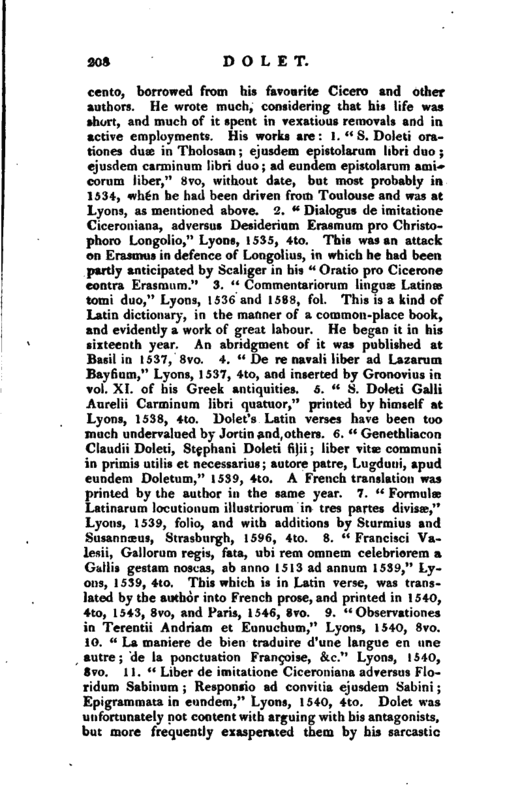 On his return to France with the ambassador, he pursued his study of Cicero, who became his favourite author; and he began to make collections for his commentaries on the Latin language. 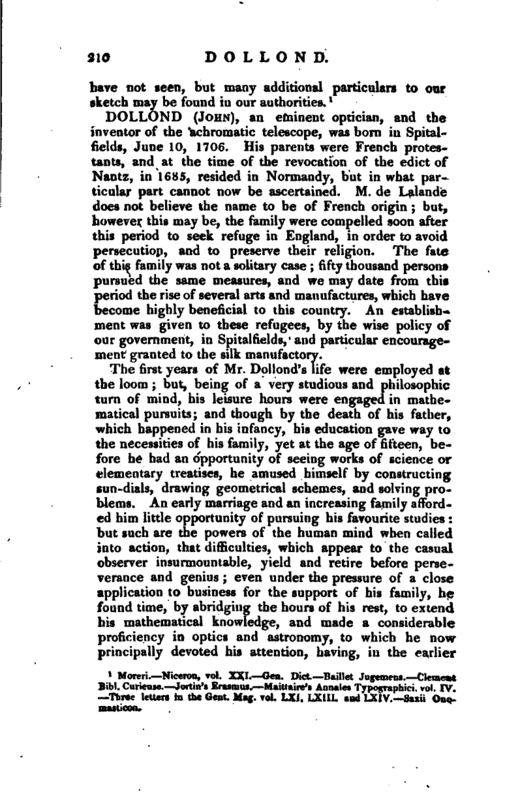 His friends having about this time advised him to study law, as a profession, he went to Toulouse, and divided his time between law and the belles lettres. Toulouse was then famous for law studies, and as it was frequented by students of all nations, | each had its little society, and its orator or president. 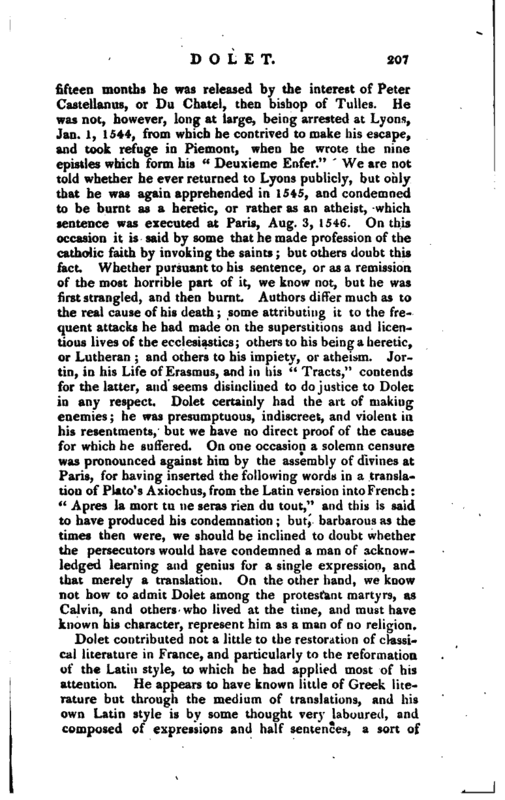 The French scholars chose Doiet into this office, and he, with the rashness which adhered to him all his life, commenced hy a harangue in which he praised the French at the expence of the Toulousians, whom he accused of ignorance and barbarism, because the parliament of Toulouse wished to prohibit these societies. 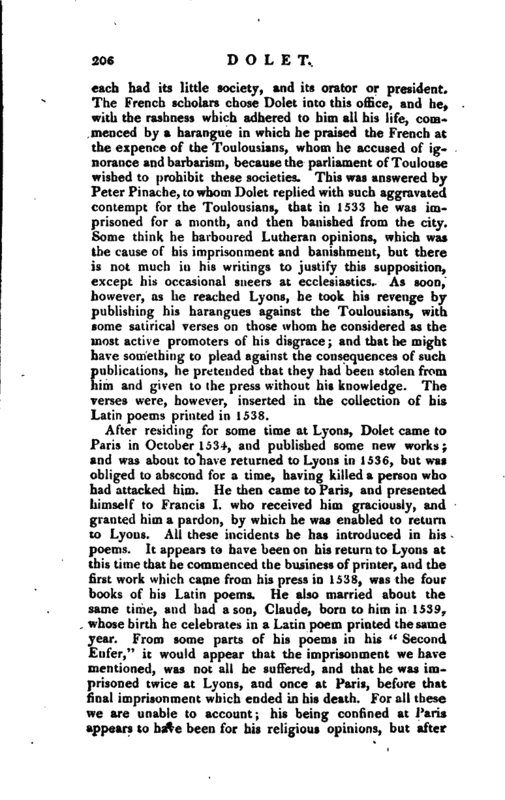 This was answered by Peter Pinache, to whom JJolet replied with such aggravated contempt for the Toulousians, that in 1533 he was imprisoned for a month, and then banished from the city. Some think he harboured Lutheran opinions, which was the cause of his imprisonment and banishment, but there is not much in his writings to justify this supposition, except his occasional sneers at ecclesiastics. 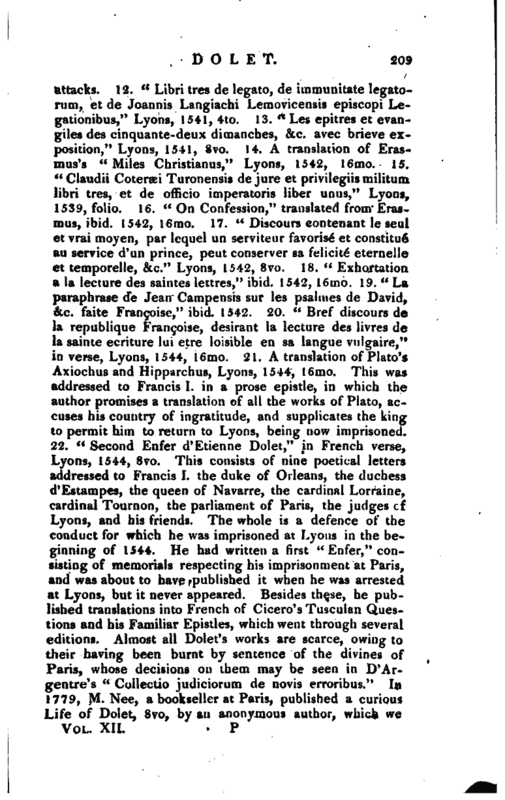 As soon, however, as he reached Lyons, he took his revenge by publishing his harangues against the Toulousians, with some satirical verses on those whom he considered as the most active promoters of his disgrace; and that he might have something to plead against the consequences of such publications, he pretended that they had been stolen from him and given to the press without his knowledge. The verses were, however, inserted in the collection of his Latin poems printed in 1538. 1 Moreri. —Niceron, vol. XXI. Gen. Dict.Baillet Jngemens. Clement Bib!. Curieuse. Joitin’s Erasmus. Maittaire’s Annales Typographic!, vol. IV. Tliree letters in the —Gent. Mag. vol. LXI. LXIII. and'LXIV. Saxii Onomasucou.